... posted in this subforum during the first day of registration. You ask, “Why? That’s way too late to reveal Team Codex!” I say if you can’t be bothered to actively check the Team Codex boards, then there’s something to be said about your commitment level. I will update this thread with the team we'll support when the games begin. This is (hopefully) the last public update concerning Team Codex for a very long time. All further announcements will be made in the Altador Cup IX Subforum. 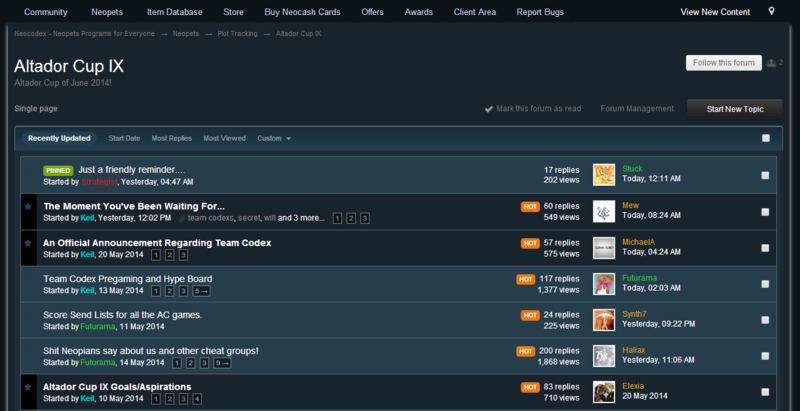 Here is a screenshot of the current ACIX subforum as a preview of what you'll see. Note that I'm using the Blue Bohegeha NeoCodex Site Theme (available to all advanced and higher ranked members) in this screenshot. I'm not announcing Team Codex here at this moment. A new topic will be posted in the ACIX subforum later today. As a bonus perk to all ranked Private members and above, the team has already been posted in their Private General Chat. As for the times during those day, they will be kept at random to times even I don't know. If you're waiting for access of those days, why not chat/discuss with other Codexians. I understand that some of you prioritize the Altador Cup, but might as well get active. You never know, you may gain the free Advanced+ forum rank complete with all the benefits of an Advanced member without the monthly paid subscription. Details about getting your sparkly and fabulous masculine and buff Team Codex Userbar are found within the forum. Just to point out: Team Codex isn't limited to SS for our team. If you stay for moral support or even play legit, we would love to have you. Team Codex is a (questionable in many standards of human beings *cough* @Elindoril, but loyal, caring, and fun) family that maintained our community longer and stronger than any other cheating forum. 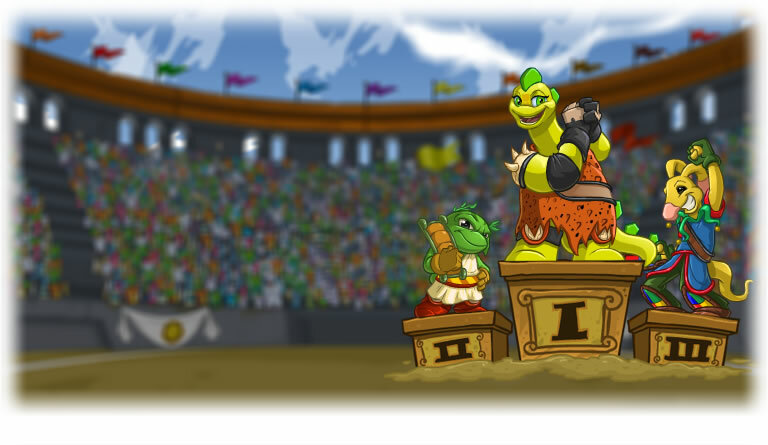 Even if you don't play the Altador Cup, make a new topic, make a blog, introduce yourselves. We have a strong social component with the most remarkable people. Still don't have access to ACIX subforum? Worry not! As long as you're trying to be active, the requirements will decay to allow even the non-Advanced members access. 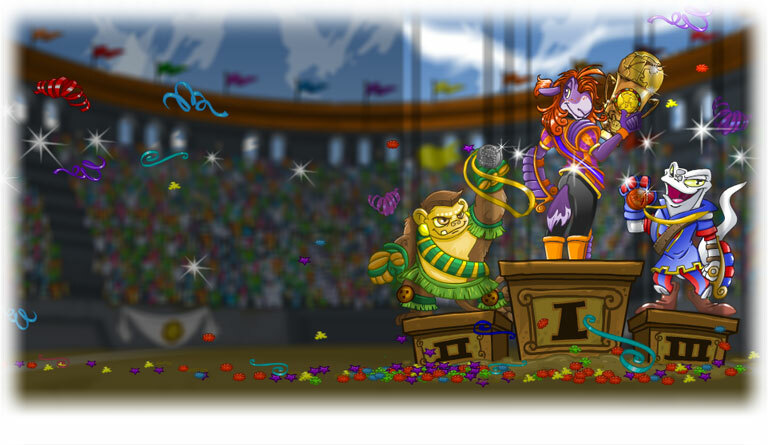 Check back this thread on the first day of registration in Neopets to find out how and when. The requirements will decay twice before the games start, allowing more and more people access before the Altador Cup tournament starts. The higher post count you have, the earlier access you will have. If you don’t have automatic access, don’t fret. We may set up new permissions before registration officially opens up or before "loyal" registration closes. We still have a week of waiting from the day this announcement has been made. For now, just post and get to know the community though other subforums. It's best if you do so in the long run. The reason why I'm keeping the team a secret is not because the possibility of it being leaked. I know a fact it will be leaked eventually. I'm banking of when it will be leaked because timing is everything in the pre-registration period. I already know of the teams of ASGs/forums who 100% decided their teams, even if a consensus was made only few days ago (haha) and all that info can be used against them with the right preparation. I may seem exclusive, but people have to trust me with this. And it's not like I'm permanently locking out people out in an elitist bottleneck sort of way.That's the last thing I want to do. And at this time, worrying over whether or not you'll have access is futile when registration isn't open at all. Rest assured, with the progress that's being made, numerous people currently locked out can safely access the ACIX subforum at least 5 days before registration closes or even a few days after registration open. Those who make visible strides to be active in the community and constantly check Codex for updates will eventually have access. If I make anyone feel excluded, I wholehearted apologize. All my actions are to further secure our victory and I really do value our lurking population in Codex because I know full well the power of numbers after being in several "legit" ASG's and multilingual forums in-game. In your comment about the lack of security of leaked information among the higher "ranked" members. You're right. There's no guarantee, but with the time and effort (and possible money) invested here, they visibly showed that they can be active and are dedicated. Such characteristics should be rewarded. To finally quell all the turmoil, please be patient and hold your judgments until registration opens. If you feel dissatisfied with this plan, feel free to PM me or post here. I'll answer to the best of my abilities and hopefully we can reach an understanding. Do not make assumptions based on what you see and hear about Team Codex. It is of your best interest to wait a few days until you see with your own eyes the announcement I made. To Private/Retired: I have not changed the team I posted. It is still the same and I had no thoughts about changing it since the very beginning. The goal of Team Codex is to have everyone join one team for the Altador Cup and play Score Send/AoB our hearts out. This will bring the community together and hopefully bring home a first place trophy! What Team Codex needs to do this year is simply run our Score Senders 24/7 and cover our chosen team's weaknesses! For the past years during the AC, I have score sent basically 24/7 with no freeze or anything bad happening to my account. If my accounts were to be frozen, it was because of ABing poorly or something stupid as scamming a user even though I never neomailed or posted on the boards on that one account. I have obtained All-Star by Score Sending and have accumulated many points for the prize shop.The key to safe score sending during the AC is just to play the game yourself and see what scores/times it takes to play the game legit. It really isn't difficult in the slightest. The team even provides safe SS lists and a guide for you to make your own. Try to even out the games you play a day if you can't max out at all. However, if you are able to max out games, maxing out SoSD and MSN isn't hard at all, and you can even do those in addition to maxing out YYB. On occassion, I or someone else will post a daily quota that all capable members should commit to if they don't already have their own SSing schema. Best of luck to all Altador Cup Players, both legit and illegit, in whatever teams you decide to join and may Team Codex dominate with another Gold this year. ... posted in this subforum during the first day of registration. oh well... so when is the first day of registration?? Everyone please do note that this choice is not up for discussion. Keil has put a lot of effort into calculating and selecting the optimum choice for Team Codex and I am positive that he (and many other people) would greatly appreciate not having that choice criticised or disputed. So, when it is revealed, your choice is to roll with it, or go solo. Of course, we'd love to have everyone on board to share in the glory, but if that's not for you, Mum's the word. Yeah, I actually did my research and got intel about a few ASG you never knew existed on top of the two I'm in. You won't be disappointed. And a fantastic choice it is. Oh man, I'm looking forward to this. Thanks for putting so much effort into finding the right team Keil. This is amazing, Keil. Thank you for all your effort! I'm actually really excited about something I always said I would never be excited for. I KNOW HOW TO SPELL! SHUT YOUR FACE! Edited by Sweeney, 12 May 2014 - 06:08 PM. See? Me spells very much well. Yay Team Codex!! Let's smash 'em again this year! I'm not advanced and I can see that board. We'll deserved to be at least 2nd place that year in my heart. I'm still bitter about it. I'm very excited about this years AC!!! Lets go team codex!!! He has 153 posts and has been a member for 2 years. My bad I didn't read. Oi, I'm still at work. *shakes fist* Don't you be crackin' no whips at me, boy!